The beleaguered CEO of General Electric is taking hits over the company's 2016 performance. Here's why shareholders should be optimistic. Change ain't easy, especially when you're a massive conglomerate that spans multiple industries. And General Electric (NYSE:GE) is one of the biggest. The company is in the midst of a long and complex transition, with CEO Jeff Immelt at the helm. But when the waters get rocky, do you stick with the captain or throw him overboard? Several analysts think it should be the latter. 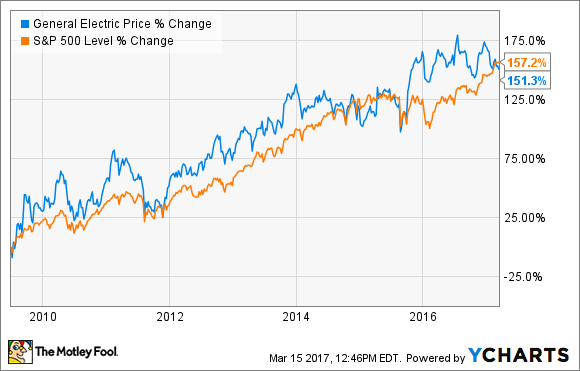 Immelt, they argue, has presided over a decade of underperformance and has made several questionable -- even disastrous -- business decisions during his tenure. But investors should be aware of three things before they join the calls for Immelt's departure. General Electric's CEO Jeff Immelt is hoping to transform GE into "the digital industrial company." Image source: Getty Images. Yikes! 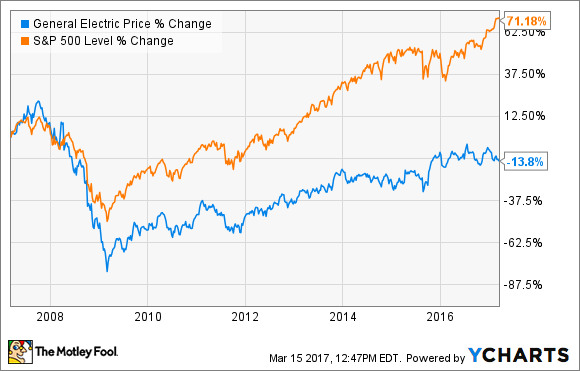 Sure enough, GE's stock hasn't even returned to its pre-recession levels, while the S&P 500 has well exceeded them. However, you have to remember that during the recession, GE had a major financial arm, GE Capital, which issued private-label credit cards and mortgages, among other things. That meant the company was hit disproportionately hard by the financial collapse, which occurred just under 10 years ago. GE Total Return Price data by YCharts. In fact, on a total return basis, the stock has risen 23% higher than its pre-recession level. Now, while this may be cold comfort to investors who bought in right before the financial crisis, it does show that the stock's underperformance "for the last 10 years" is somewhat overstated. When I was a teenager, cleaning my room, my mother would sometimes come in halfway through and say, "You haven't done anything! It looks worse than when you started!" Of course, it eventually ended up a lot neater, but you can't judge whether a chore has been successful until it's complete. The same is true for Immelt's GE. Immelt has been presiding over a massive transformation of General Electric's portfolio from an incredibly diverse corporation with holdings in finance, consumer goods, and media into a focused industrial and industrial technology company. Better still for investors, most of these efforts have been quite successful. The company has divested the majority of its financial holdings, spinning off the consumer credit card business as Synchrony Financial in a deal that was so popular it was oversubscribed by 3.2 times. Divestitures of much of the rest of GE Capital are expected to be completed more than a year ahead of schedule. The company successfully won de-designation as a systemically important financial institution (SIFI) from the U.S. government, removing restrictions to unlocking value for shareholders. GE sold its low-margin consumer appliances business to Chinese company Haier for a higher-than-anticipated sum, and it is merging its underperforming oil and gas business with Baker Hughes (NYSE:BHI) later this year to create the second-largest oil services company in the world. The company is also investing in new industrial technologies like 3D printing. What makes this change even more remarkable is that -- with the exception of the sale of GE's stake in NBC Universal, which happened all the way back in 2013 -- all of this change has occurred in less than two years. For a massive company like General Electric, that's a lot in a very short time, and there's still more to come, like the sale of GE Water and the eventual spinoff of the new Baker Hughes. Patient investors should wait until at least 2018 to gauge the success (or failure) of Immelt's changes, rather than rushing to judgment before the proverbial room is fully cleaned. Two big news items have come out recently about Immelt. The first was that his 2016 compensation dropped by 35% as the company failed to hit certain financial performance benchmarks. The second was a Fox Business News report that Immelt was in the "hot seat" with activist investor Nelson Peltz, whose Trian Partners owns just under 1% of GE's stock. Immelt's detractors point to these reports as evidence that it's time for a change in leadership. Certainly, GE's stock had a rough year in 2016. Much of this was thanks to the underperformance of the company's oil and gas unit, whose profits were half of what they were in 2014. And as the person responsible for the company's heavy investments in oil and gas, Immelt should bear the blame. However, I'd rather see a CEO miss short-term performance targets, take a pay cut, and annoy Nelson Peltz than see someone make short-term decisions to protect his own salary that end up costing the company in the long term. And if oil and gas prices begin to recover this year, Immelt's -- and, for that matter, GE's -- 2017 performance is likely to look very different than it did in 2016. No, Jeff Immelt isn't a perfect CEO. He made some poorly timed investments in oil and gas that the company is now paying for. During his tenure, the company's returns on capital -- generally seen as a sign of management strength -- have fallen considerably. But it's also important to note that he's been presiding over turbulent times, particularly during the financial crisis, and has been working hard in recent years to transform GE into a leaner and more focused company that can better reward shareholders. 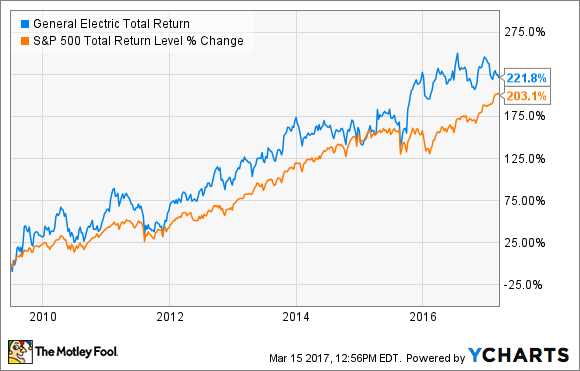 In 2016, for example, GE returned more than $30 billion to shareholders in dividends and buybacks. Smart investors should stick with the company through this time of transition, and then assess their investment.